Story — Kawartha Coffee Co. Welcome to Kawartha Coffee Co.
Bobcaygeon's Award-Winning Hot Spot — Legendary Food, Drinks & Entertainment! Relax and refresh in our large garden patio, enjoy our fabulous mural and comfortable seating in warm weather. Come inside to our friendly restaurant when it's chilly. “The Doctor’s Office” welcomes you year round. Local food meets global flavour . . . plus music, plus art! 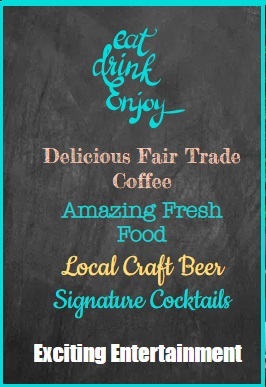 Our food is farm fresh, our coffee is fair trade and delicious, our beer is from local craft breweries. You’ll love our curated wines, signature cocktails, and legendary lemonade. And don’t miss our professional karaoke and live music events — bring friends or make friends, it’s Bobcaygeon’s most fun entertainment! Call it kismet, call it fate, you have to agree that we're dishing up a generous slice of local history. Here's the story. It seems 58 Bolton Street (just beside Foodland) has an interesting history. The handsome old building that houses Kawartha Coffee these days was once far better known as the Doctor's Office. Here's where the kismet comes in. Kathleen also has a personal history with the building. By the spring of 2018, Kawartha Coffee had become a Bobcaygeon feature for over 15 years. Kathleen was ready to expand and was excited to take over the grand old building across the street from KCC's previous Bolton Street home. It would be larger and -- The Patio! She was determined to bring new life to the building. With that gorgeous large patio, it offered an opportunity for Kawartha Coffee Company to perk it up, to do some different things. “I hope to bring in more artists, more music, interactive events — make it a real community hub,” says Kathleen. But first, the town turned out to watch the flying food truck! One fine day in June it was delivered, hooked up, and hoisted high over the wrought iron fencing and into the Doctor's Office patio. Its new life was about to begin serving up fabulous Mexican food . . . and looking a lot fancier. Whether you pass a lazy hour or two enjoying the gorgeous full-wall mural and outdoor garden seating, or come into the cafe to warm up in the winter with your favourite hot drink . . .
A visit to Kawartha Coffee is just what the doctor ordered.